Fortified walls of Mdina (November 2018). On my third full day in Malta, I decided to stay on and explore the western part of the main island. 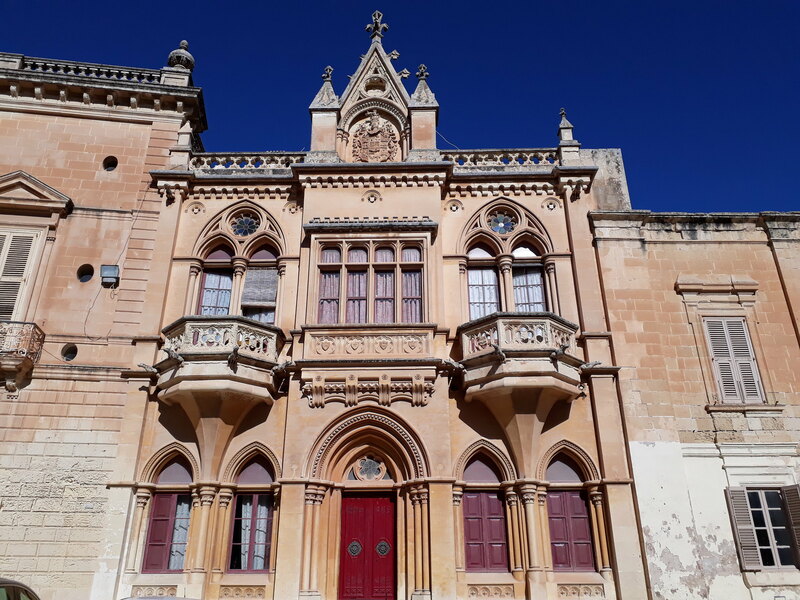 Having spent the previous day hiking through the lush vegetation on the island of Comino, I stayed in Malta to discover more of its history. With that said, I embarked early to get a head start on the three (well, four) towns I would be exploring for the day. While there are plenty of bus lines that connect just about every corner of Malta, it’s also important to know that many buses are 1) often late, and 2) run infrequently, ranging from every 20 minutes to one per hour. I learned quickly to time the buses during my week there, since I would otherwise lose time getting to-and-from places. While it’s feasible to visit multiple towns in one day, you’ll most likely be out the entire time, from sunrise to sunset. Knowing bus lines and times is incredibly easy: I found the Journey Planner feature on Malta Public Transport’s website, which was a huge time-saver for planning routes and knowing when the next bus would come. Highly recommend it, especially if you’ll be relying on buses to get around (which is pretty much a given). That said, I woke up early to catch the bus first to Valletta, then all the way west to the Dingli Cliffs. In total, it was an 80-minute journey, as the bus somehow weaved through the bustling, one-way streets passed dozens of small towns and neighborhoods. If I’d thought that taking public transport in France was thrilling, then it looked pretty tamed compared with Malta’s! I reached the last stop sometime around 9:00, and from there it was a 10 to 15-minute walk to the cliffs. Now, I’ve seen my fair share of gorgeous cliffs, from those in Dover to Étretat in France– Dingli was no exception. 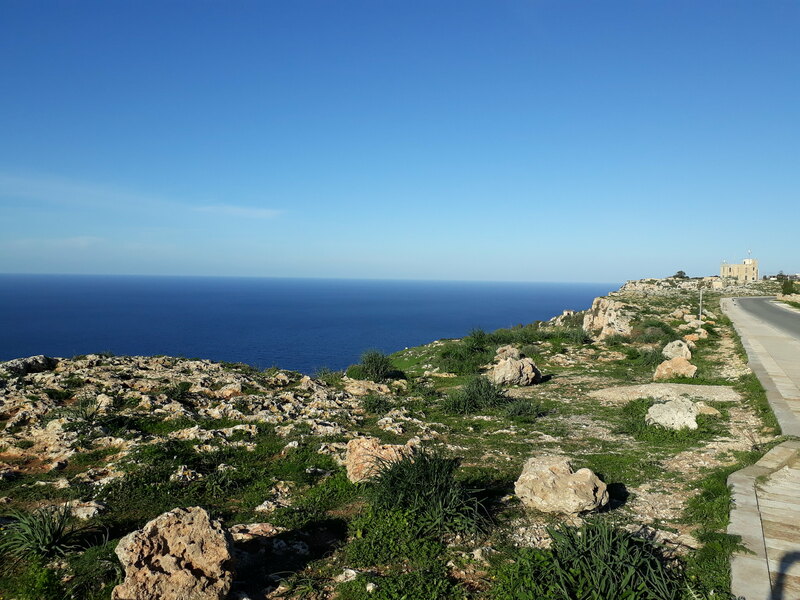 Perched high above the deep-blue, Mediterranean, its limestone surface is draped with a thin layer of green vegetation, offering vast views of the ocean. It was worth a moment’s pause to admire it all. Next, I headed to Rabat, a town about two kilometers away. While I could’ve taken the bus over, I opted to be a bit adventurous and walk over– plus, I only had a 12-journey bus pass, and I needed to save them for other trips I’d be taking over the next few days. Although I’m used to walking long distances on my travels, I would say that walking along the side of the road in the countryside wasn’t what I was accustomed to. There was no sidewalk for perhaps half of the walk, so I had to be careful not to get close to the middle of the road, where the occasional car would zip by (and with no intentions of braking for pedestrians). It turned out fine, but I wouldn’t recommend everyone does it! I reached the town of Rabat, where it’s known for St. Paul’s Catacombs. I’m usually not one for visiting crypts and sites of death, but as the catacombs are highlights of the neighborhood, I decided to check them out. After paying a five-euro admission fee, I entered the open-air site. 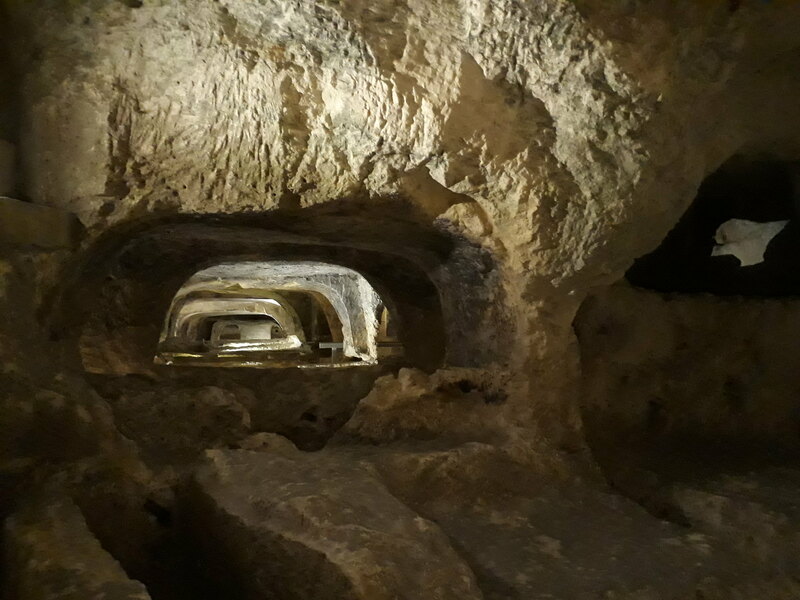 I likened the structure of the catacombs to the necropolis of Tarquinia in Italy, in which the sites are underground, only accessible by entering the several-dozen “huts” scattered in an open field. It was a lot of ducking into these “huts” to explore the dimly-lit mazes of carved stone and burials. While typically not my cup of tea, I ended up liking the visit. Speaking of tea, I soon headed to the neighboring city of Mdina. 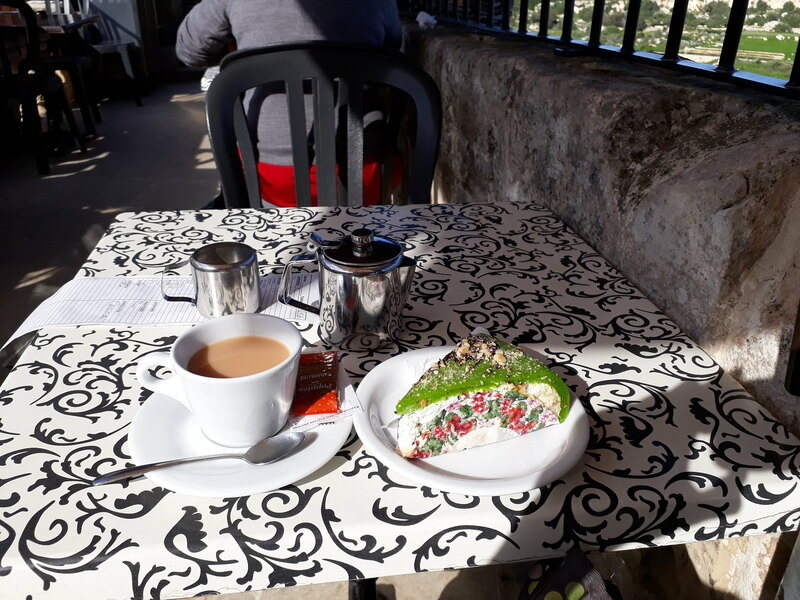 It’s one of the popular towns to visit on Malta, and after a brief visit of St. Paul’s Cathedral, I popped into a recommended salon du thé for a mid-morning pause. 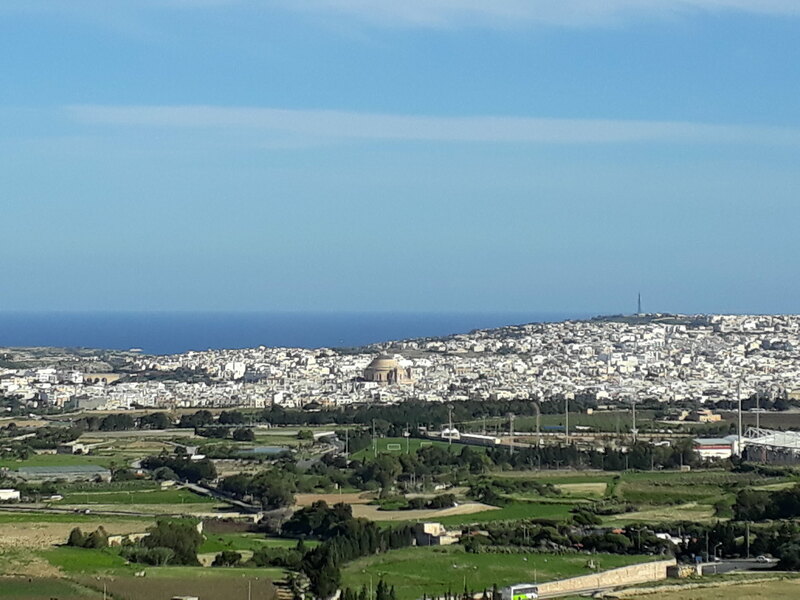 The place was actually quite touristy, which was no surprise: besides serving amazing cake, its terrace seating offered sweeping views of the green countryside, along with views of the town of Mosta– one can see its iconic Rotunda in the distance. The cassatella cake I ordered was to die for. A Sicilian-based confection, it’s a sponge cake that’s layered with ricotta cheese and filled with candied fruit and chopped nuts, then finished off with a brightly-colored marzipan on top. I hadn’t had cassatella before, and I can say that my life was changed upon that first bite (may or may not be exaggerating…). Balanced with an English breakfast tea with milk, the mid-morning break was well-worth it (and with terraced views to boot!). Views of Mosta from the tea room. 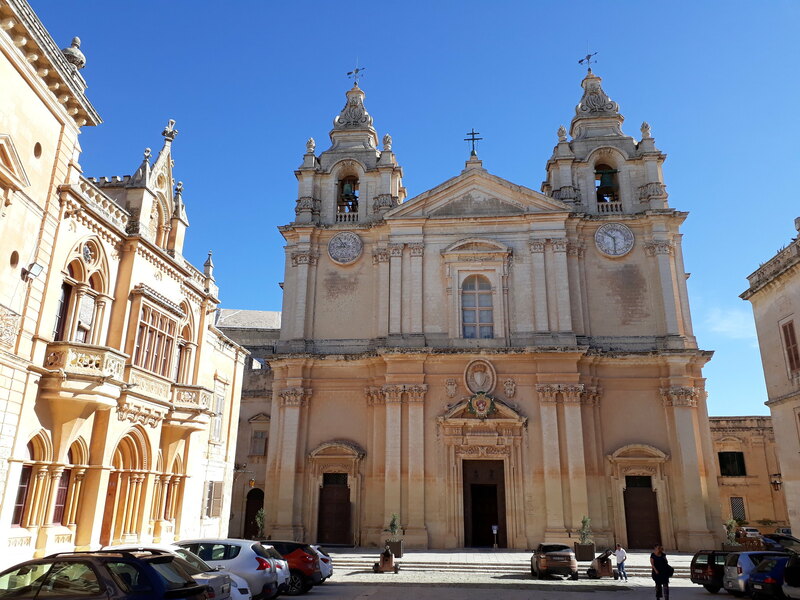 I continued to explore a bit more of Mdina. The city is fortified, with its limestone walls dating back to the 8th century BCE. 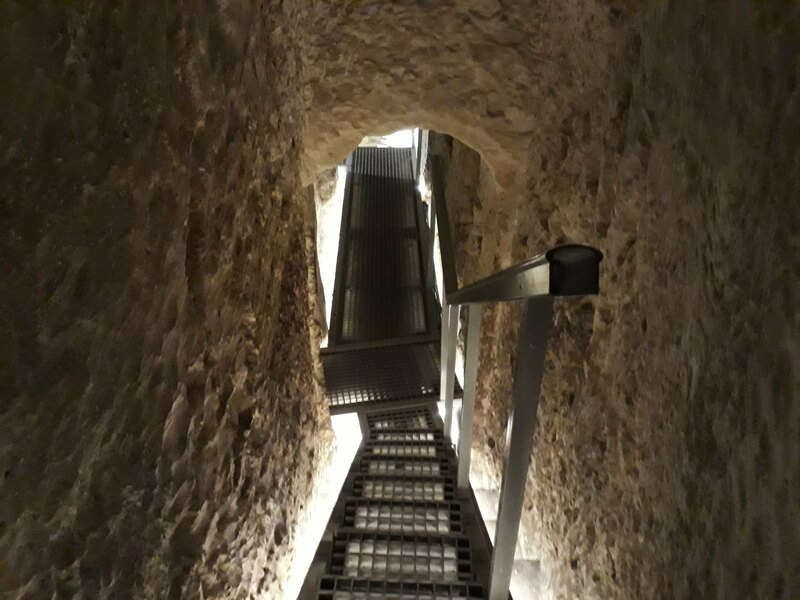 The entire place felt like a step back in time, and I could imagine the mix of Phoenicians, Romans, and Arabs who’d once lived behind the fortifications. 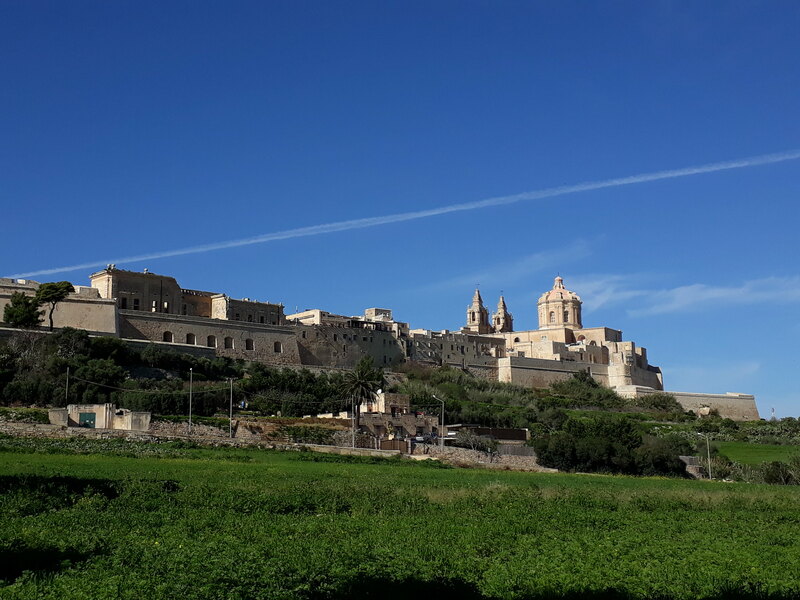 Mdina is nicknamed “the Silent City,” as it’d experienced de-population after the 16th century due to the administrative center moving closer to Valletta. Interestingly, it’s far from being silent, as many visitors flock to town every day to see it. Although the cake break had been rather substantial, I still headed to a pastizzeria for a light lunch. 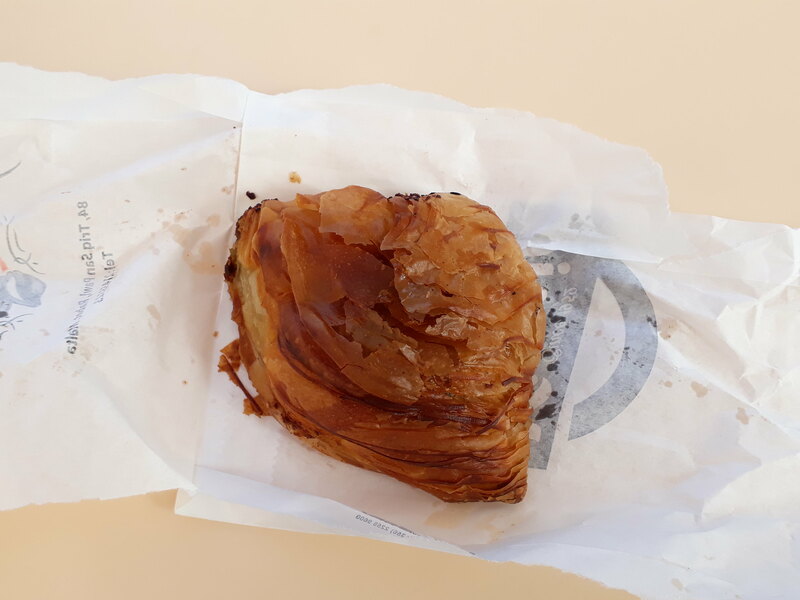 I ordered a pastizzi, a savory Maltese pastry that’s ridiculously flaky on the outside and filled with either ricotta cheese or mushy peas on the inside. I opted for the latter, which was incredible– extremely oily and earthy-tasting from the peas, it was a filling “light” lunch that was enough to get me through the other places I’d be visiting in the afternoon. 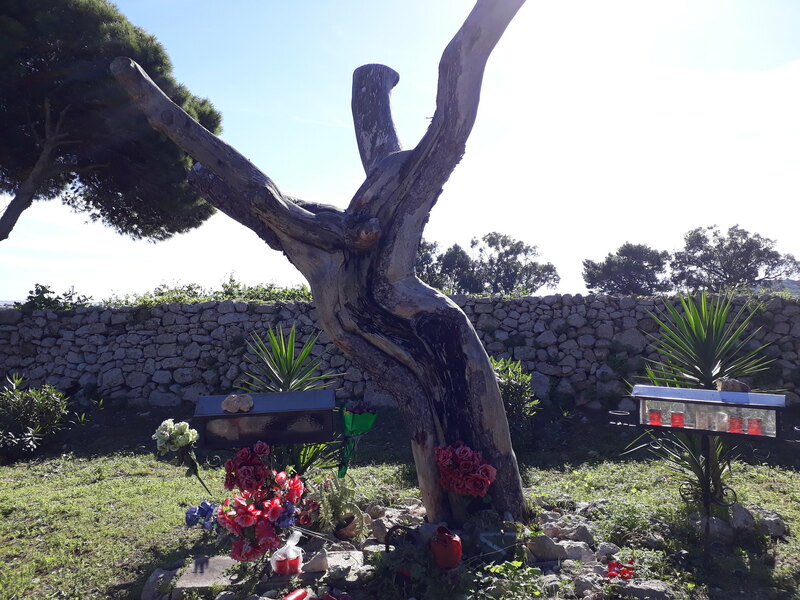 Heading out of the fortified walls of Mdina, I once again walked along the fast-lane highway to what’s known as the Jesus Tree. Considering its location (i.e. along the highway in the middle of nowhere), it’s often overlooked by drivers and visitors alike– I only knew about it from Atlas Obscura, and even though I’m not religious, the pareidolia was too much for me to pass up! Although I did risk my life *somewhat* trudging alongside the highway, the tree resembling Christ himself was a refreshing sight from the usual touristy path. I walked to the nearest bus stop, where I took it to Mosta. 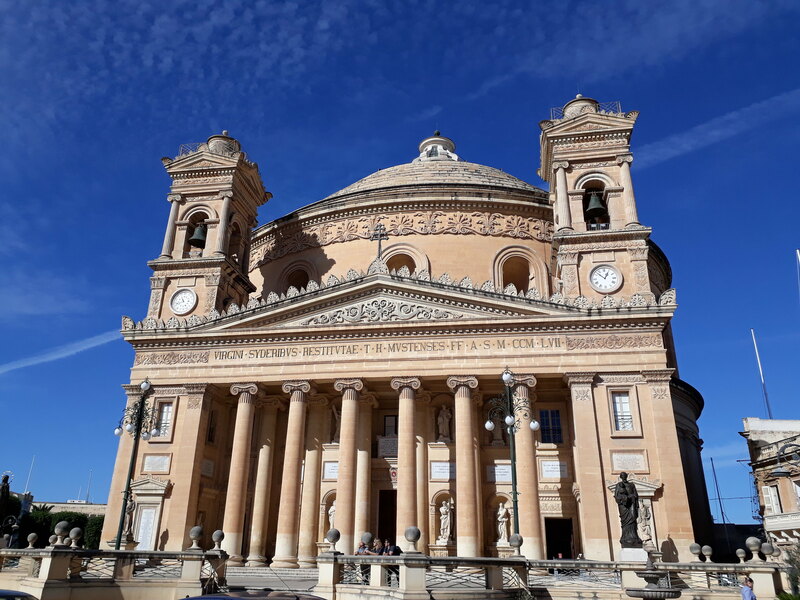 The third-largest town in Malta, Mosta is home to the famous Rotunda, which has the largest, unsupported dome in the world. It was a two-euro fee to go inside and, like with St. John’s Co-Cathedral in Valletta, I was struck by the lavish, symmetrical beauty inside. The interior made for excellent panoramic shots, and one could get vertigo just by staring at the architecture for too long! Besides the Rotunda, I also headed across town to briefly see the Speranza Chapel, along with its eponymous bridge. The river has since nearly dried up, but the chapel, small as it is, had an interesting history: it was built after a girl had survived a Turkish invasion in the 16th century, to show that faith and miracles happened. It was also a quiet part of town, as not too people were around, which was a pleasant respite from the center. Considering its relative proximity, from Mosta I headed on-foot to Naxxar, about four kilometers away. The walk took about 50 minutes, but mostly on sidewalks (no more walks along the highway! ), and I soon reached town at mid-afternoon. The main reason I wanted to visit was to see the Palazzo Parisio, an 18th-century palace that’s become a tearoom-garden today. I’d seen stunning photos of the former staterooms, and I wanted to check them out. 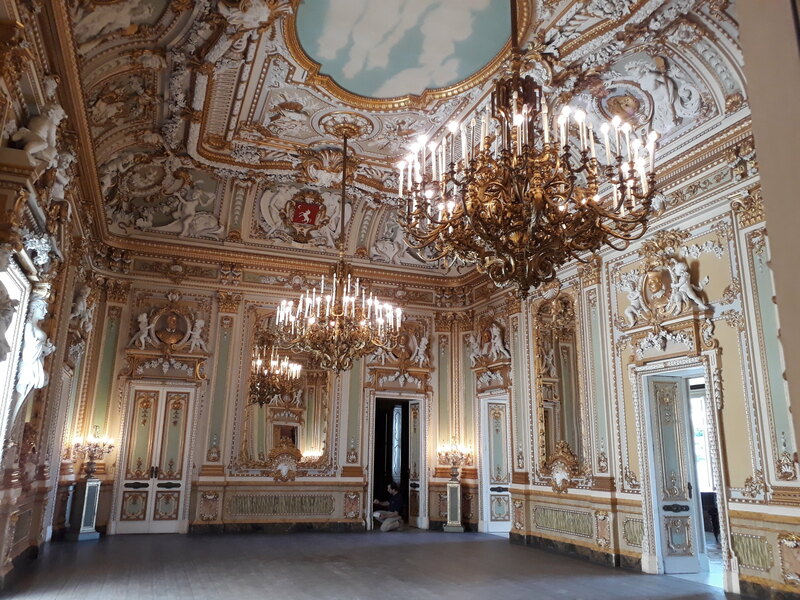 The admission fee was steep at nearly 10 euros, but I got to see the dazzling interior, along with the lush garden outside, where several people were enjoying afternoon tea. I ended my day shortly thereafter, catching the next bus back to Sliema. It’d been a jam-pack day of visiting three to four places– although my time at each was short, I got to see the highlights and enjoy the architecture and food while at it. Since the towns were so small, it was possible to cover them within a couple of hours, although for some visitors, it’s also a good idea to take one’s time, have tea and cake, and enjoy the laid-back pace in a historic city. More to come soon– until then!